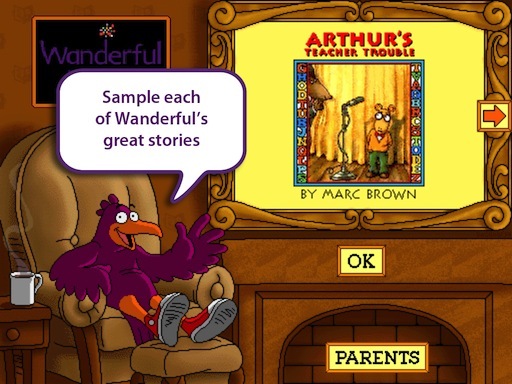 I first read about Wanderful Interactive Storybooks at The Daring Librarian, and determined to download the free Wanderful Interactive Storybook Sampler onto my iPad. (iTunes) "Sampler" means you get a taste of each story, and can go on and buy the full version if you like it. The stories are classic US stories, but many will be known to kids across the world. You might even remember these stories in the 90s from their previous incarnation on CD Rom: Living Books by Broderbund. What I like: Each of the five interactive stories is basically a story plus a game. Just the way a child will pause a story in a fold-out book to look at an illustration, or stop a read-aloud to ask a question about the picture, children can listen to/read a page, then choose to bring page elements to life. The story part has the text highlighted as it's read aloud by the character voices. The game part consists of bringing objects and people in the pictures to life by tapping with a finger, and watching the ensuing short animations. For example, in Arthur's Birthday by Marc Brown, the first illustration has so many details that can be brought to life. Tap on the Cereal pack and it announces itself as "Cereal" while shaking about. Tap on a nearby bowl and cereal pours into the bowl, milk pours from a jug, and the cereal snaps and crackles itself into disappearing. Tap on Grandma and she asks for advice re cake-making. Tap on the kettle and it comes to life and plays a little tune. Tap on the teapot and its lid comes off, producing tooters and streamers. There are several more animations just on that one page! Kids can also tap on individual words in a story to create a story of their own. I love the sense of humour evident in the developers. For instance, in The Berenstain Bears Get in a Fight by Stan and Jan Berenstain, tap on the lamp and the fireflies have a conversation as the sun rises and they clock off from their night shift. There are so many other little quirks and giggles that kids will enjoy. Technology has come a long way since the 90s. But there isn't the least feel of old-fashioned about the Sampler. Only in a good way I guess, a way in which the app doesn't overwhelm the story, but works side by side with it. Yes there are bells and whistles, but they're tuneful, you play with them, and move on to the next part of the story. There are settings that make the app quite flexible and useful both at home and in the classroom. If you buy the app, you also have access to Classroom Activities aligned with the US Common Core State Standards. There is a Wanderful Youtube Channel where you can check out the Sampler and many of the books. Wanderful have also produced some stories for Mac OSX, with plans for Android and Windows, as well as adding French, German, Spanish and Japanese. Here's Wanderful's own introduction to the storybooks. Thanks for sharing. We like to test out the app too because sometimes apps are just not age appropriate. Good point, Reshama! I have found a HUGE difference in quality with book apps, and game apps too. Lots of hype but sorting and sifting for quality takes ages. I still haven't gotten into apps with my kids. I feel overwhelmed by the choices and since they read so much by themselves, I haven't been motivated. Thanks for sharing at The Children's Bookshelf, I hope you join us again when we return in September. The choices CAN be overwhelming, I agree, Erica. I hope you enjoy your summer break!